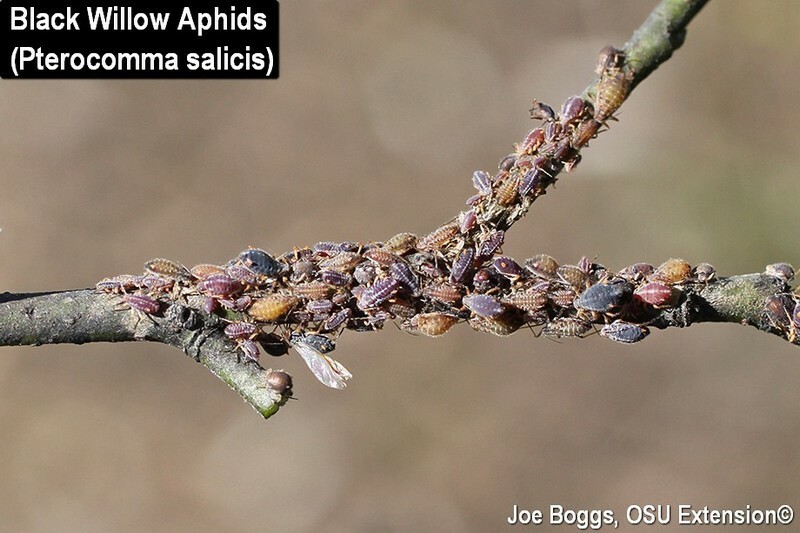 I got a phone call from a homeowner in southwest Ohio who said they had an aphid problem on willows. They described the situation as huge numbers of aphids dropping from large willows onto their home, driveway, and barn; sticky "sap" raining down on everything; and all manner of things acquiring a blackened patina. During the peak of the outbreak, the trees were buzzing with wasps. Now they are seeing tiny, gnat-like creatures flittering around their landscape. They noted that the aphids and their buzzing entourage were so bad just a few weeks ago, they could not use their patio. I immediately bolted through the door to pay a visit, but had to return a short time later to collect a few essential items for the site visit (e.g. camera, car, homeowner address, etc.). The culprit plaguing the homeowner's willows, and the homeowner, was the Black Willow Aphid (Pterocomma salicis). Their common name refers to the color of the adults, not its willow host; this aphid may be found on a wide range of willows. The homeowner was not exaggerating in describing the dimensions of their aphid outbreak. There remained a substantial number of aphids; however, the most telltale evidence that an aphid apocalypse had occurred was the black sooty molds covering almost every flat surface beneath or near the infested willows. The sooty molds had colonized honeydew that had issued forth from the aphids. Of course the sugary honeydew had also attracted various wasps including yellowjackets and baldfaced hornets causing the trees to literally buzz with activity. The black willow aphid is considered a "warm season" aphid with populations rapidly developing during the summer. Summer colonies are made-up of multiple overlapping generations of wingless females and their offspring; there are no males. This form of reproduction without males is called pathogenesis. Parthenogenetic females can dispense with all of the rituals associated with mating (e.g. going on dates, feigning interest in male stories, marriage, etc.) and immediately start producing offspring as soon as they mature. I contend this form of reproduction is doomed by evolution; my wife disagrees and cites football. The bottom line is that it means populations can build rapidly to outbreak proportions. However, as days shorten in October and November, the parthenogenetic females start producing males with wings (apterous) and wingless females that mate with the males and lay eggs. The gnat-like creatures the homeowner is now seeing flittering around their landscape are the males; no doubt looking for a football game. Of course, aphids are the "wildebeests" of our forests and landscapes; everything eats them! In fact, this is one reason population outbreaks are so rare and are seldom repeated year-after-year on trees. I was able to find all manner of aphid predators and "aphid mummies" which are clear evidence of the aphid-elimination work of parasitoid wasps (Aphidius spp., family Braconidae). The parasitoid wasp females lay a single egg inside of a developing aphid nymph. The egg hatches as the nymph nears the completion of its development. The resulting wasp larva consumes the aphid's innards, pupates inside the dead aphid, and emerges through a tiny, round escape hatch. The homeowner was keen to spray for the aphids; however, I proffered a wait-and-see option. It was obvious that the "aphid season" is winding down and their enemies are continuing to deplete the population. While I couldn't say that an outbreak would not recur next season, I advised it may be best to wait until next season to see if high numbers begin to reappear, but be prepared and react early.